Visit our TICKETS page for details about purchasing tickets for this performance. A breath taking program of chants, hymns and antiphones by the greatest female composer of all times, including extracts from the morality play Ordo Virtutum. Hildegard, Abbess of Rupertsberg (1098 – 1179) was one of the most extraordinary and multi-talented women of all time, escaping canonisation until the year 2012 – no small miracle. Of all the activities this woman, now saint, engaged in, be it a politics, natural science, theology or counselling, it is her music that most reveals an infinitely rich and creative inner life. Her chants, freely composed and devoid of any hint of formula, were described by herself as “a feather on the breath of God”. 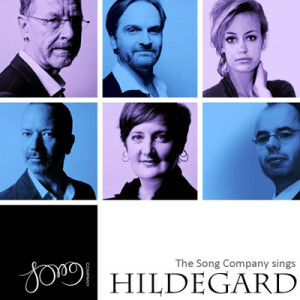 The Song Company is Australia’s leading vocal ensemble. Since its formation in 1984 it has developed as one of the most vibrant and extraordinary vocal ensembles in the world. The group’s repertoire covers vocal music from the 10th century to the present day and is unique in its stylistic diversity. 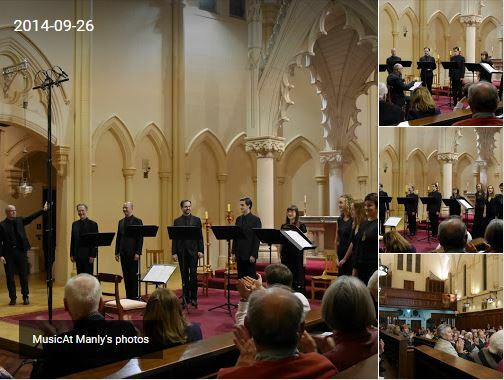 Under the leadership of Roland Peelman, Artistic Director since 1990, the six-voice ensemble has developed its style by successfully integrating serious scholarship, tonal clarity, vocal daring and unbridled performance dynamics. The Song Company remains at the forefront of contemporary vocal music through an extensive commissioning program and new collaborations. Through a longstanding commitment to education, an annual concert series, as well as many recordings and broadcasts, the Song Company has built up an impressive following around Australia and around the world. You are invited to meet the artists after the concert. Koen van Stade received his initial training as a boy soprano in the St Laurence Cathedral Choir in Alkmaar, The Netherlands. He went on to study Singing with Peter Kooij and Max van Egmond; Church Organ and Church Music with Jos van der Kooy; Conducting with Harold Lenselink at both Amsterdam Conservatorium and The Royal Conservatory of The Hague. After graduating, Koen continued vocal studies with Paul Hameleers. He specialised in Gregorian Chant at the Schola Cantorum Amsterdam. During his studies Koen had begun working as an ensemble member of the most prestigious Early Music groups in Europe, including Collegium Vocale Gent (Philippe Herreweghe) and The Amsterdam Baroque Choir (Ton Koopman). He sang more than 2,000 concerts in major international cities on every continent with these ensembles, and recorded over 60 CDs and hundreds of radio and television broadcasts. Several of these CDs were awarded international prizes including the Diapason d’Or (twice), a Grammy Award, the Preis der Deutschen Schallplattenkritik (twice) and the Choc de la Musique. In 2003 Koen became a member of the vocal chamber ensemble The Gesualdo Consort Amsterdam (Harry van der Kamp). With this ensemble he participated in the premiere recording of the complete works of Dutch composer Jan Pieterzoon Sweelinck. This project resulted in a 20 CD collection which received an Edison Award from the Queen of the Netherlands. Koen relocated to Australia in 2009. He is a Lay Clerk and Vocal Coach for St Mary’s Cathedral Choir and an Academic Tutor at St John’s College, University of Sydney. He is also a Vocal Tutor at Sydney Conservatorium of Music, and Sydney Grammar School. Koen van Stade appears regularly as a soloist and ensemble member of Sydney’s leading groups including The Song Company and Pinchgut Opera.